Dried starfish can make a nice addition to your ocean- or beach-themed craft project. You can place shells and dried starfish on mirrors and picture frames, and even inside clear lamps and glass-top coffee tables. 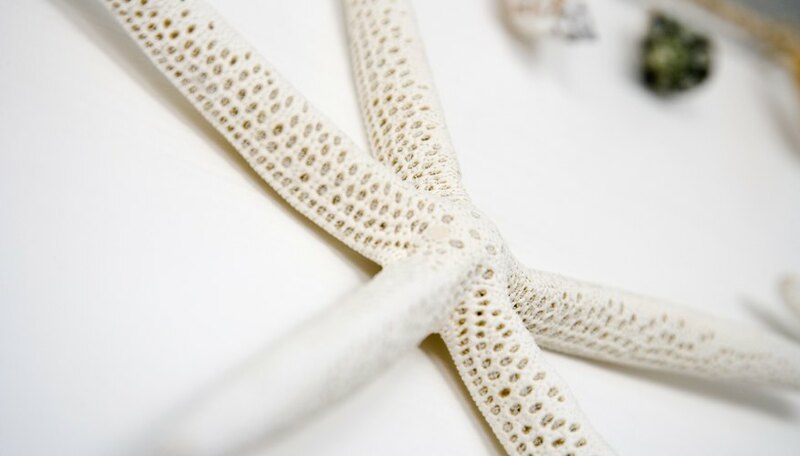 Many crafters also glue dried starfish onto decorative nets that are used as wall hangings. It is possible to flatten a dried starfish by rehydrating it and repositioning the limbs. This method can be used to make slight alterations to the position of the legs on most species of starfish. Place the starfish in a bowl or bucket of warm water. Allow it to soak for several hours or until it's soft and pliable. Place the starfish atop a newspaper-covered board. Gently adjust the starfish limbs so the specimen sits flat. Apply strips of masking tape to strap down the starfish's legs. The tape holds the starfish in the proper position. Place the board and starfish inside a large plastic garbage bag and tie the bag closed to slow the drying process. Allow the starfish to dry for several days. Slow drying is key to this process. When the drying process occurs at a rapid rate, the specimen may curl or crack. Do not dry the starfish in a humid or sunny location. Humidity can lead to mold and the sun may cause condensation, which can also lead to mold formation. Seal the starfish using a clear spray-on lacquer. This prevents disintegration, which is common in specimens that are exposed to sun or dry air. This flattening process should not be attempted on the spiny cushion starfish and similar species with a crustacean-like shell and short, thick limbs. These species have very limited movement in life, so it's virtually impossible to alter the positioning of a dead, dried specimen.